The original idea for KAZU goes back to a little house on Lily Street in New Monterey. At that time, FM was a stepchild to AM radio. AM Radio was king. The big stations in the Monterey area were KDON 1460, KIDD 630 and KMBY 1240. Over in Carmel, KRML 1410 was playing host to the filming of Play Misty for Me at night, while in the daytime was spinning the hits of yesteryear (meaning the 1940s and 1950s). There were some changes coming to the poor, ignored FM dial however. Eddie Johnson, a insurance salesman from Salinas, had applied for a FM frequency in Carmel (soon to be KLRB). Over in Salinas, the new owners of KERR 103.9 ("Grandpa Charlie" and friends) were trying to figure out how to move it out of the valley and up to Mt. Toro for better coverage. KWAV in Monterey was just being sold and still playing jazz in the daytime and classical music at night. KSBW-FM (now KDON) was playing elevator music. Meanwhile, back on Lily Street, a little half-watt FM signal appeared over New Monterey on the lower end of the dial. 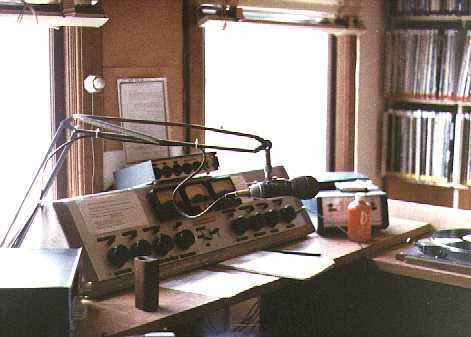 If you were lucky enough to hear it, the music and talk would have reminded you of listening to KMPX or KSAN, then the big alternative FM stations in San Francisco. Financed out of my pocket, and really just a hobby, it lingered on for a year, with no license, while other things were going on around the Monterey Bay. 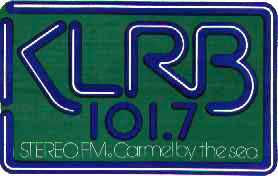 KLRB signed on in April of 1971, and during that same week KERR changed its format to match that new, experimental sound coming from "that radical station in Carmel". Across the bay in Santa Cruz, a small group had applied for a 10 watt signal, soon to be named KUSP. 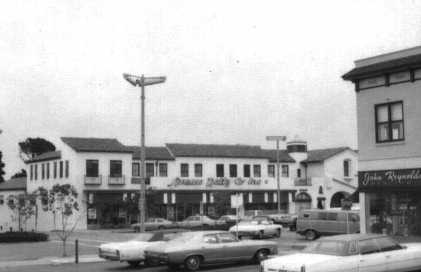 The little station on Lily Street moved to Cannery Row, above where there is now a carousel, but at the time it was the "Whole Earth Craft Center". It lasted all of four days, when Eric Norburg, the nurdy program director of KMBY (also on Cannery Row) called the FCC in San Francisco to complain about the "hippie" radio station next door. Despite the fact that it only reached four blocks of the Cannery Row area (and was Part 15 compliant), the FCC reluctantly told the operator to turn it off. Slightly discouraged, the station moved up to David Avenue and resumed its occasional broadcasts, away from pesky program directors of cheesy AM stations. 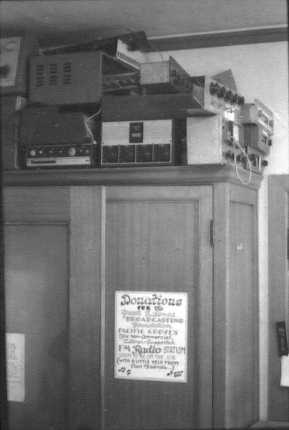 In April 1972, KUSP in Santa Cruz began broadcasting from behind the kitchen of a restaurant near downtown. At nearly the same time, KKUP turned on their small ten watt transmitter on Mt. Umunhum (high atop the mountains between Santa Cruz and San Jose) and began by playing the Doobie Brothers nonstop for a week. The little station and myself moved from David Avenue to Scotts Valley. 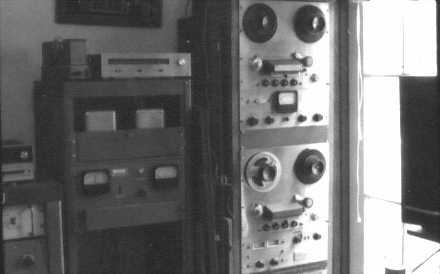 As if by magic, there was now a new station one could hear in the Santa Cruz Mountains, and also across the bay into Pacific Grove, but only if the fog was just right, calling itself "Experimental Radio, North Bay". Despite the growing variety of choices on the FM dial, it still had something different to offer. It also still had no license. 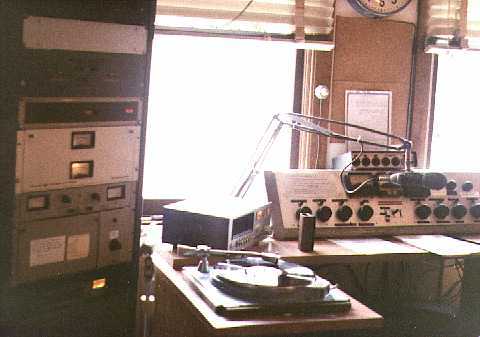 By 1975, KUSP had increased its power and moved its transmitter to Mt. Toro, giving it a very large coverage area and a much larger listening audience. But with this increased coverage came increasing pressure from within the station. Financial pressure, differing philosophies over programming and operations, and $10000 in back taxes made the future appear somewhat grim for KUSP. Also at that moment, a new station appeared in Gilroy, a wild combination of folk, country, rock and humor called KFAT (the predecessor of what is now KPIG). It seemed as if KUSP might have to go out of business, what with the increased competition and internal problems. My friend Jeremy Landsman, one of the owners of KFAT, and I were visiting over at his house in Los Gatos on a hot July afternoon. We were talking about all kinds of things, not the least of which was radio, and the state of affairs at KUSP. He and I agreed that if KUSP were to go dark, there should be some other station besides KKUP to serve the non-commercial listening audience. He bet me $100 that I couldn't get a license for my little experimental radio station. He was kidding, but at the time I took it seriously. I went to the Aptos Public Library, copied a few pages from a book describing how to start a non-profit corporation, and went looking in Pacific Grove for some of my like-minded friends. We applied to the state as a non-profit corporation in September 1975 and were official by Christmas of that year. By then, I had moved back to Pacific Grove and was busy collecting and repairing equipment that I knew could be used for such a station. In the meantime, that little experiment was still on the air, now from my garage behind Congress Avenue, but with some real intentions behind the experimentation. The application to the FCC went out in the spring of 1976, and I proceeded to get a real job to pay back some of the corporate bills. A real job meant working as the transmitter supervisor for KSBW-TV, up on Fremont Peak. That in itself was another story worth telling sometime. In what seemed like the ultimate setback at the time, the FCC sent us a letter explaining that they didn't think we had enough money to operate the station. They also didn't believe that anyone could build a station with only $1200. While I didn't want to explain to them that we were already on the air from my garage, I figured that we, as a corporation, should prove that we were serious about this radio station. All of the board members got a letter from their bank, pledging their savings towards the building and operation of the station. The total pledge came to around $7000. It must have worked, because the FCC granted our construction permit in August of 1977, five months after those pledge sheets were submitted. The board of directors announced a public meeting to choose the call letters for the new station. Over 60 people showed up, many more than we had anticipated. I thought that KOTR (K-OTTER) would be good, a couple of very funny (and some not so funny) suggestions were made, and then someone suggested KAZU. The vote was taken, and was overwhelmingly in favor of KAZU. It was the first public vote taken on anything at the station, and it seemed at the time that this just might work. 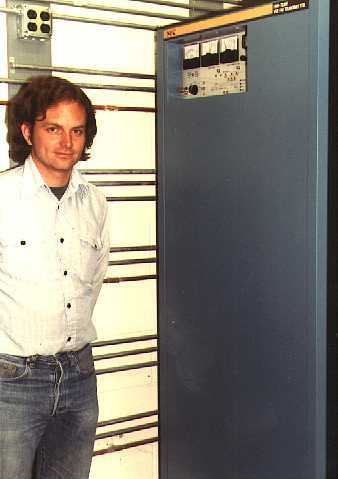 That same August, in a balcony office rented for $75 per month and overlooking downtown Pacific Grove, I worked on putting together a control room. Because I never intended to take anybody up on their "pledge", I was going to have to figure out how to get all of this stuff to work, and also make it simple and sturdy enough to be used by people that didn't know how to run a radio station. I built a control board, repaired KUSP's old ten-watt antenna system, fixed a ten-watt transmitter that had been thrown away by KSJO in San Jose, and hooked up the whole shootin' match. While all of this was going on, KUSP had found a way out of most of their difficulties, and it seemed like we were going to be sharing the left end of the dial after all. Personally, I figured that this was a good development, letting KAZU become the station that served the Monterey Peninsula area, with KUSP taking care of the northern part of the bay. While I was getting everything put together, I received word from City Hall that the mayor had overruled the Planning Department and was going to forbid "that Steve Slatkow" (our radical defense attorney) from putting "his" antenna on the roof of the building. Never mind that it was within the city guidelines for height limitation, or that the city had a taller antenna in violation of these same guidelines. Oh boy, we get to go to a hearing! The hearing was that next Tuesday at the council chambers. The planning commission, after some behind-the-scenes lobbying, took a vote and overruled the mayor. It turned out that the mayor had been pressured by the owner of KOCN, also in Pacific Grove, to keep us off of the air, and some of the planning commissioners were made aware of this fact. It also did not hurt that one of our most active volunteers had a father who was on the planning commission. Connections do make a difference, I found out. The forty foot pole with antennas attached went up the next day. When I turned on the transmitter for the first time, it went up in a cloud of acrid smoke. We waited for spare parts for two weeks. KAZU continued to test on into the fall. The License application went out to the FCC in early in Sept., and by Oct. 7 we were already doing regular broadcasting with a crew of volunteers about 12 hours a day. Rosalie came into the station that evening with a telegram that had come that afternoon, and said "We got it! We've got a license!". At that moment, I suppose it was official, but for me, it was the beginning of yet another chapter in a 7 year history of trying to do something different for people listening to the radio on the peninsula. It had cost $1700 to put on the air. When we began, there was only a handful of people that were on the air. And, there was the problem of the key. The building manager only allowed us one key to the gate downstairs, and KAZU was on early, before any of the businesses sharing the offices arrived. Because I was living on 16th st., one block up from the station, we decided on a temporary safe spot to keep the key; in my mailbox! Never mind that I moved that next spring, the mailbox was still the place where you could find the key in the morning, and also the place you put it late at night after sign off. This, as far as I know, continued into the 80's. In a thinly disguised scheme to influence programming, I donated 1200 classical albums to the station, and let the station borrow about 400 more folk and bluegrass albums to start. It met with limited success, and made me realize that people had their own ideas about what they wanted to hear. After all this was supposed to be COMMUNITY radio! From the start, the programs heard on KAZU were different from all the others you might hear on the local radio dial. The concept was, at least in my mind, to be an alternative source for music and talk, with a local focus. Because KUSP was playing classical music in the mornings, we decided to play it in the afternoon. This concept worked for a while, except when the other stations would add something that conflicted with our schedule. Eventually, I thought we would have to take the lead and stop playing program tag, so to speak. There were some programs that nobody else had come up with, however. One of them, put on by a woman that called herself "Rainbow", was a combination 'new age talk, herbal remedy, and back to the land show all mixed up with whatever music could be grabbed at the moment. Then there was live music on Thursday nights, hosted by the "Lost Ranger and Smokey", out of tune banjo and all. With ten watts, we could go boldly where no one with more power would dare go! From the beginning, there were reception problems. After all, we were only 10 watts from a rooftop lower than most of the rest of the Peninsula. We arranged to be received by the cable TV company, and after some large amount of time, we were finally heard by listeners hooked to the cable in Carmel and Monterey. However, most of the Board wanted to reach a larger area (at least Monterey!). So, the task of finding a suitable place to put a larger transmitter was undertaken. The logical place seemed to be at the top of Forest Hill, but the Presidio and the army said no way. The city of Monterey had a parcel of land with a water tank just below the Presidio, so we tried to get them to lease us a spot there. The neighbors protested with such alarm that it wasn't to be. I remember the city council meeting at which our proposal was brought up to be a very embarrassing moment for the station and myself. For the first time, I was exposed to people who not only didn't care about the station, but also didn't like the station. The only other likely place to put the transmitter was up on Huckleberry Hill, at the Cable TV antenna site. The cable company was totally against it. We had nowhere to move to, and a power increase at the downtown studios would have been a waste of money. At that time, the FCC rules changed slightly, allowing KAZU to apply for a spot near Hidden Hills, above the airport. I submitted an engineering study, and the FCC approved it. At the same time, The Board applied for funding from the NTIA to pay for the power increase. They reasoned that KAZU was the only station in the Monterey Bay area with an orientation towards women, and convinced the Federal agency of this, based on the programming and the female majority of the Board. The NTIA approved the funding, based on these reasons. After the installation of all the new equipment, and subsequent increase in coverage for KAZU, I became more preoccupied with other things in my life, and some of the staff were becoming impatient with my casual way of engineering. At that time I was also spending many extended months out in Kentucky, helping to create what would become WMMT in Whitesburg. I decided that it was time I moved on. After all, I had spent over ten years working in one way or another on KAZU, and it seemed like the best thing. Sometimes the founder need to get out of the way of progress, even though all may not see it that way. When ever I visit my old hometown, I always tune in to 90.3 to see what is going on; It never fails to make me feel like I might have helped a few people around there. I hope that is the case. It is kind of hard to imagine that 20 years has passed since that warm summer in Pacific Grove. I do remember that the origins of the KAZU idea went back a few years earlier, to at least September of 1975 (Actually, it goes back further than that, but I will wait to tell that story until we can sit down and drink a beer or two and talk at length about such things). 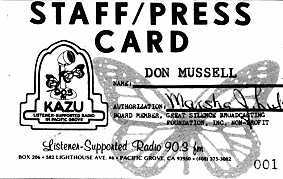 After seeing the operational crisis at KUSP that year, I was concerned that the Monterey Bay area would be without an alternative radio voice, so I went about the task of putting together the nonprofit corporation that would operate the future KAZU. Since I was living in Pacific Grove, I decided that it was as good a place as any to have such a station. And, everyone I talked to was enthusiastic about the idea. Sensing that the time was ripe, and after checking the FCC database (and a personal hunch), I found that there was room on the dial for a station. That, as they say, was the easy part. Two more years, many pages of Federal applications and a cranky mayor in Pacific Grove still couldn't stop the slow train from arriving on October 7th, 1977. That, of course, was the date the telegram arrived from Washington telling us we could be on the air officially. We had been testing our 10 watt signal since late August, and managed to hop onto the MPTV cable system, giving people outside of Pacific Grove the opportunity to hear our broadcast. All told, it cost just under $5000 to build the original station. Much of the equipment was donated by other broadcasters who were happy to give it to someone, instead of throwing it away. After lot's of repair work, most of what we had gathered was good enough to get KAZU going. Back at my other home in Virginia, I still have the original KAZU 10 watt transmitter, although it doesn't work anymore, and parts cannot be bought to fix it. For some reason, I kept it all these years. Can't say why, but maybe it's a sentimental thing. I have to admit, after being away from the area for over ten years (1983 to 1994), it was a pleasant pleasure to find KAZU still going strong. Many people I talk to have expressed their appreciation for all of the wonderful things that KAZU has done for them over the years, and I am kind of pleasantly surprised that many of the programming ideas I had 20 years ago are still there, even if very few people know how they came about. If I think about the early days of KAZU, I have to think of the people and personalities that really were the key elements in it's humble beginnings. The late Steve Slatkow, our attorney, who was well known to the city fathers of Pacific Grove, was the person who helped me navigate the various local roadblocks to building the station downtown. Robert Farnsworth helped me through the process of getting California to allow us to start a not-for-profit corporation. Marsha Lubow kept our financial (and business) situation under control, and Rosalie Smith (now at KFOG in San Francisco), our most enthusiastic first radio programmer set much of the tone for our early broadcasts. David Bean kept me calm amidst growing paranoia that someone else was going to take away our frequency. Of course, the Granary and Tillie Gorts kept us going with food, along with the many volunteers who just showed up when they heard of the station construction project. Without them, it just would not have happened. There are so many stories I could tell from the early days. Like the first live music broadcast from the tiny studio above the Sprouse-Reitz, which sounded more like a bad campfire singalong. Or, one of the early classical music programs, where the host thought that Classical meant "classic" Moody Blues and Emerson, Lake and Palmer. And the live broadcast coverage of the Butterfly Parade from the balcony next to the studio. That was fun. I also remember the winter evening that it started to hail so heavily that it looked like snow covered the streets of downtown. And the fact that our rent was $75 a month. Somehow, it seems like it was just a few months ago. It seemed pretty expensive at the time. I suppose the rent amount should remind me how long ago that really was. 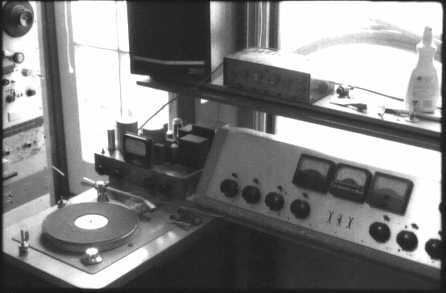 When we convinced the Department of Commerce to fund our facilities upgrade project in 1980, the increase in coverage was a big boost for the volunteers and our listeners ( you mean we can hear you in Monterey? wow....). It also brought about an increased sense of responsibility to the Board Of Directors. When I thought of building a station in Pacific Grove, I was really thinking of a station that would cater to the needs of people on the Monterey Peninsula. With the power increase to full coverage of the Monterey Bay, KAZU had to reexamine that local service, and broaden it's programming goals to better serve the entire area. While we vigorously discussed the issues, it occurred to me that KAZU was probably going to be fine without it's founder getting in the way. After all, I had more stations to build. Having just returned from the Island of Kaua'i, where I was a part of launching a new, community based, noncommercial station, I had a familiar feeling when we turned it on for the first time. 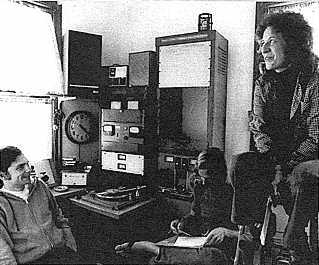 I remembered the little office upstairs on Lighthouse Avenue, and that afternoon, with Steve Slatkow and myself, switching on the KAZU transmitter, trying out the broadcast signal for the first time. And, of course, the phone ringing, telling us that our voices and music were reaching across town. That feeling never has left me, even now, when I tune in to KAZU. I'm glad it's still there.